ESSENDON has tightened its grip on a top-eight spot thanks to a thrilling win over the Western Bulldogs last night. 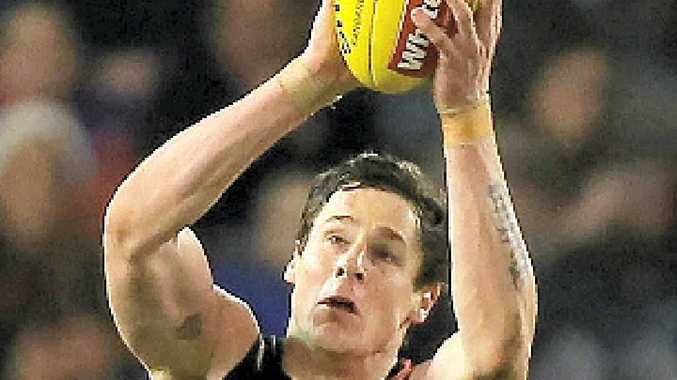 Jake Carlisle was instrumental in the victory, his eight goals helping the Bombers to the crucial seven-point victory. Down by 21 points late in the third quarter, the Bombers rallied on the back of Carlisle's career-best haul to win 15.11 (101) to 14.10 (94). At the other end, young Bulldog Jake Stringer booted a career-best five goals, the last of which gave the Bulldogs a 21-point lead one minute into the final term. The Bombers responded through Carlisle, Paul Chapman and substitute Corey Dell'Olio, whose running goal 12 minutes into the final term levelled the scores. In the thrilling final minutes it was Jason Winderlich's contested mark in the goal square that would settle the result. The result sees Essendon move level with sixth-placed North Melbourne on 10 wins, and more importantly one game ahead of Collingwood and the Gold Coast.